What is Dhyana Mudra? Dhyana, or Samadhi mudra, is the hand gesture that promotes the energy of meditation, deep contemplation and unity with higher energy. In this mudra, the seated Buddha is seen with hands placed on his lap, right hand over left, palms facing upward and fingers stretched in a relaxed pose. Sometimes, this mudra is displayed with both thumb tips touching each other, forming a triangle which represents the Three Jewels of Buddhism – the Buddha, the Sangha and the Good Law (Dharma). The circling of energy created by the triangle also promotes a cleansing of any impurities on an etheric level. The coming together of the thumb tips also indicates the union of two psychic channels in the body, as represented by the male and female principles that exist in every sentient being. under the Pipal tree before attaining enlightenment, and typically seen in icons of the primeval Adi-Buddha, Samantabhadra and Amitabha Buddha. 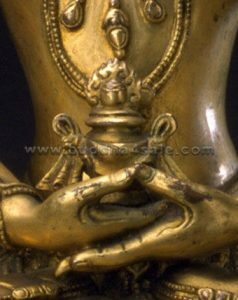 So where is the best FengShui placement for a Dhyana Mudra Buddha? It is highly recommended to consecrate a Dhyana Mudra Buddha at the meditation room, altar, the center of the home or study, etc. Just by looking at this Buddha hand gesture one can connect to the energy of deep peace and serenity.